Today in Edinburgh (my place of residence since June 2008) there is a totally exciting royal wedding. That horse riding royal one is marrying a rugby player (who may also ride horses, I don’t really know). According to my sources (Twitter) a group of people from the Highlands have been camping near Canongate Kirk since 2pm yesterday in order to catch a glimpse of the happy couple. The wedding is at 3pm today. For my part, I am sitting in the flat listening to Andrew Collins and Josie Long on BBC Radio 6 Music, eating cold pizza and trying to work out a realistic word count target that I can reach before midnight tomorrow. When the bell tolls 3, meanwhile, I’ll likely be on my way to Perthshire. Different strokes for different folks. This isn’t in honour of the wedding, incidentally – I took it a few weeks back. Presumably one of the tigers is in a white frock and the other has a kilt on today. If not, I’ll want to know why. Although not enough to investigate, obviously. 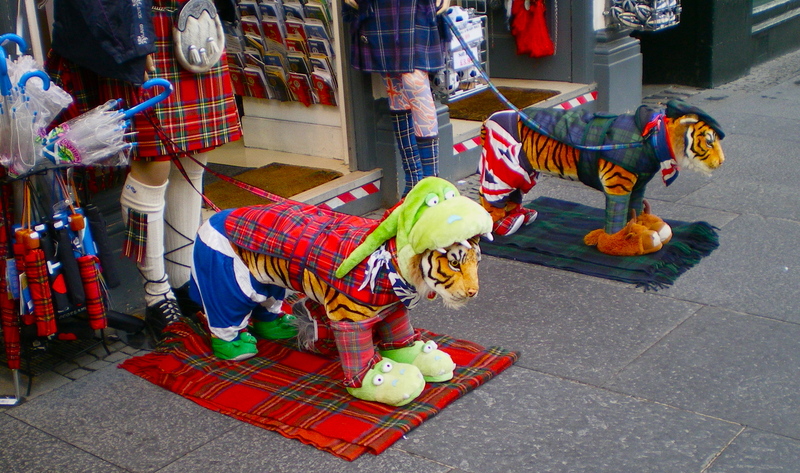 I’m not sure why the shop owner thought ridiculing the majestic tiger was the best way to attract business, but you have to admit it’s imaginative. Many of these places just blare out the bagpipe version of Clocks by Coldplay and hope for the best, but these guys have imbued stuffed animals with a genuine sense of boredom and mortification. I can’t decide which is the most upset by the situation, but am leaning towards the one with the Nessie eating its head. That’s pretty undignified. Still, this photo is a good example of something in life providing an idea for a story so look out for that at some as yet unidentified time in the future. And have a lovely Saturday.